Based around the correct scores in Premier League and Championship games, the Sky Super 6 is effectively like a football version of the lottery, where you need to work out the exact results in six chosen football fixtures. 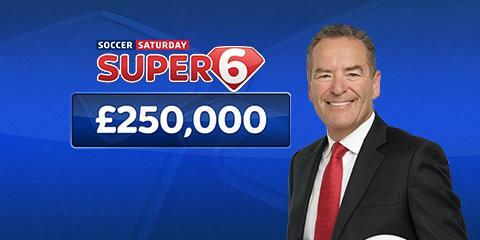 It might be considered as appearing mundane, but the chance to take between £250,000 and £1 million is enough reason to enter your Super 6 predictions each week. If nobody is able to correctly guess all six final scores chosen by Sky Bet, a £5,000 prize goes to the person with the closest prediction, so there really isn’t a reason not to try your hand at the competition. The only difference between the Sky Super 6 and simply buying a lottery ticket is that you can enhance your chance of winning the Soccer Saturday Super 6 by being clever with the way in which you choose your predictions. When you’re stuck with what to predict for the chosen Sky Super 6 games, one way of working out what’s likely to happen is to look on bookmaker websites, where the odds will indicate what they expect will happen. This not only implies the outcome of the match, but also how many goals will be scored through the Over 2.5 Goals and Under 2.5 Goals markets, as well as who will score through the Both Teams To Score (yes or no) market. Although it could be argued that you’ll take more of a fun element from playing the Sky Bet Super 6 by making outlandish predictions, there’s only a slim chance of winning if you do. If you focus on getting behind what looks capable of happening then you should hold a realistic chance of winning, even if it’s massively unlikely that anyone will win the game at all. This can be done by looking into past form to determine what the outcome will be, who will score, and how many goals are likely to occur in the chosen football game. The final thing that you will be pitted with is the Sky Super 6 Golden Goal Prediction, which could end up being the difference between winning and losing. Your prediction will be for the first goal scored in all of the six games, and while a lot of people will opt to predict something late into the first half, the safest option is to aim low, as there’s often an early goal in one of the games, as it’s unlikely to reach half-time with a goalless scoreline in so many fixtures.